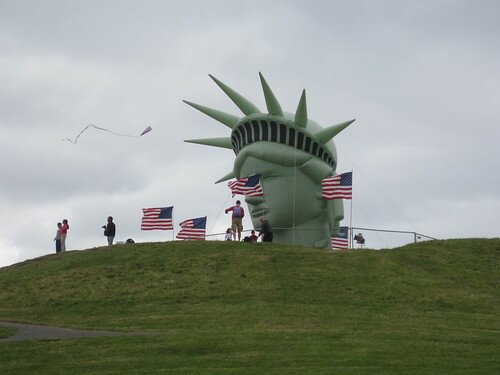 50,000 people will be descending on Gas Works Park tomorrow for the fireworks display. So you better believe they’re taking today to get as much set up as possible. I swung by and snapped a few photos of the pre-festivities. Lady Liberty is in place, the banners and stage are set up and the fireworks barge is stationed for the big show. If you’re planning on attending the 2011 Fourth of July festivities, check out MyWallingford’s guide of things to know before you go. Meanwhile, if you’re in biding your time in Fremont, swing by Bliss and Dream, both of whom have some buy-two-get-one-free tank and tee deals going on. 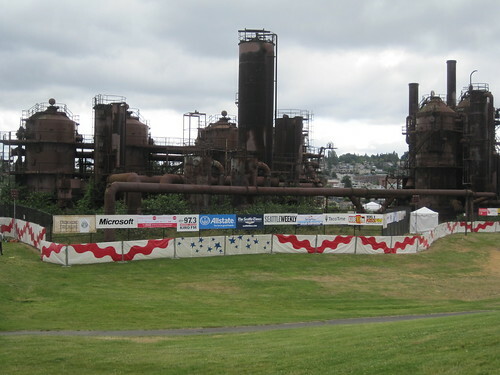 Thinking of crossing over the neighborhood line to celebrate the 4th at Gasworks? Our sister site, MyWallingford.com has a primer of what to expect, what not to bring and a timeline for the day. The soggy 2010 Fourth of July festivities. Thankfully this year is expected to be much nicer! Earth Day is this Friday, April 22nd. A celebration intended to inspire awareness and appreciation for the natural environment, there will be plenty of events going on around the world as well as right here in Seattle. One of the events is happening right around the corner in Gas Works Park. The Sierra Club, CoolMom, Earth Ministry, Washington Environmental Council and Climate Solutions are hosting a free community Earth Day Celebration on Saturday, April 23rd between 11am and 3pm there. The event will celebrate Washington’s anticipated transition from coal-power while highlighting the need to support the E.P.A. in its efforts to protect people across America from the dangerous pollution associated with coal burning and to make sure we do not export coal to other countries where no E.P.A. exists. The event will feature bands, food, speakers and a make-your-own-kite activity. For more information on the event and Coal-Free Washington, visit their site or check out the event’s Facebook page. Last year the Family 4th at Lake Union was saved thanks to donations from Seattlites and local companies from the area. Over $500K was raised and the fireworks show that followed was considered one of the best ever by many. The success of last year’s fund-raising doesn’t mean this year’s celebration is all set, however. Although 68 percent of the event budget has been secured, another $162,000 needs to be raised by March 1st in order for the 2011 show to go on. If you’re interested in helping, there’s a couple ways to do it. You can make a donation directly to Family 4th at http://family4th.org by March 1st (site may load slow due to increased traffic). You can also show your support and encourage others to join the campaign by downloading one of the Family 4th widgets to your website or blog. Enjoy Gas Works Park while you can, because parts of it and its parking lot will be closed to the public for several weeks starting Sept. 27, as Seattle Public Utilities (SPU) continues an ongoing study of offshore sediments, remnants of the contamination left in Lake Union’s sediments by the manufactured gas plant and other industrial facilities that once operated at the site. This 20 acre point on Lake Union was cleared in 1906 to construct a plant to manufacture gas from coal – later converted to crude oil. Import of natural gas in the 1950’s made the plant obsolete. The city acquired the site for a park in 1962. The park was opened to the public in 1975. The boiler house has been converted to a picnic shelter with tables, fire grills and an open area. The former exhauster-compressor building, now a children’s play barn, features a maze of brightly painted machinery. The environmental testing will account for heavy equipment drilling of groundwater monitoring wells, and that is scheduled to take place weekdays during daylight hours. While it’ll be noisy at times, Puget Sound Energy’s contractor will monitor sound levels. Vehicles will be coming and going during the testing. Visitors to the park will still have access to the snack bar and restrooms, but they will be restricted from areas where drilling activities are taking place and areas where equipment is stored. More information about this cleanup is available on the Washington State Department of Ecology’s website. Despite clouds covering up that moon, the hill lit up, in this imaginative production created by Lucia Neare and shared with families who brought kids, dogs and sleeping blankets to see the show. Light poured from spotlights cast upon performers costumed as owls, horses, cats, rabbits and clocks. Time ticked by quickly as they and other dancers dressed in top coats and top hats, and horn musicians in white pajamas, treated the audience to song and dance numbers such as “Fly Me to the Moon,” and “By the Light of the Silvery Moon,” set amidst a white dreamscape. Performers sauntered in and out of the crowd, curtsying and dancing during the numbers and in-between. They also gave away white paper windmills to eager children, who didn’t need to blow for them to spin. When you wish upon a star, this is the kind of production you get, one that sticks with kids (and adults) long after the evening is over, the stuff of sweet dreams. Sleep tight, and good night. If you saw “Lullaby Moon” at Gas Works Park or elsewhere throughout the city last year, you know not to miss the free show when it returns Friday evening. If you missed this hard-to-explain performance — which creator Lucia Neare calls a “wonder” — join hundreds (perhaps thousands) of others at Gas Works at 7:00 p.m. on September 10. There isn’t a bad seat in the house. Return to a world of wonder in Lullaby Moon 2010. Please wear white and bring a sleeping bag or blankets to keep cozy. Those with early bedtimes are welcome to attend any part of the festivities. Lullaby Moon 2010 is a free, large-scale, site-specific public performance celebrating the new moon. The spectacular continues the joy and mythology of the 2008-09 series that enchanted thousands of Seattle residents. Lullaby Moon celebrates our precious place in the Milky Way galaxy and the promise inherent in everyone’s dreams. You can see pictures and read much more about previous “Lullaby Moon” performances here. The images in this post are from last year’s Gas Works show and were taken by Mary Witter. Dozens more are on her Flickr page. Only one lucky Seattleite (or someone who lives in the area) will receive “a New Belgium, fully-loaded, hand-crafted, Fort Collins-built commuter bike” on stage in the closing ceremony of the Seattle stop of the 13-city Tour de Fat in return for taking the leap of donating his/her gas-guzzling vehicle to benefit a nonprofit; but more than 4,000 people and their families are expected to descend on Gas Works Park for the full day of events, including a bike parade. The ride is free, but a $5 donation goes toward bicycle and environmental charities – and you receive a beer in return for your token that’s good for next year’s tour too. So, the last thing you want to do is drive your car in the surrounding streets. Bike! But if you do, try to print out this form and drop it off at the registration tent so you don’t have to wait in line. Thou shall come as a participant not a spectator: It’s a costumed celebration of human-powered transportation. Muscles not motors, coasters, v-brakes and rotors. Come in your favorite alter ego, because when everybody’s weird, no one is. Maybe next year, you too can see if you can take the plunge and apply for the trade and extol the virtues of why you think you could go car-free on video. By agreeing to trade your polluting car for a new bike and committing to sparkle motion, human-powered transport, on stage at Tour de Fat, you become an inspiration to the congregation and beyond. Your vehicular cleansing is filmed, as are your car-free trials and triumphs over the following year, causing thousands to idolize your efforts and begin commuting by bike (we hope).